The 2 coracoclavicular ligaments (the conoid and the trapezoid ligaments) are found medial to the acromioclavicular joint and attach from the coracoid process on the scapula to the inferior surface of the distal clavicle. These ligaments provide vertical (superior-inferior) stability to the joint (see the following image). [3, 4] Compression of the joint is restrained mainly by the trapezoid ligament. The deltoid and trapezius muscles are especially important in providing dynamic stabilization when these ligamentous structures are damaged. Allman and Tossy initially proposed a 3-grade classification [8, 9] that Rockwood expanded to 6 types of injury (see the following images). [10, 1] Type I and II injuries are the same in both classification schemes, with type III injuries in the Tossy classification subdivided into grades III, IV, V, and VI in the Rockwood classification. Type I-III acromioclavicular injuries are the most common injuries. 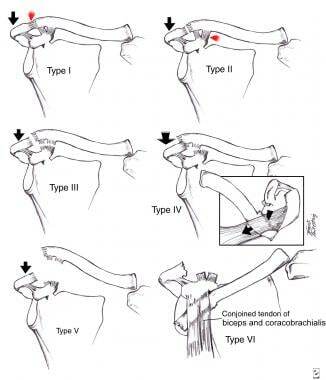 Classification of acromioclavicular joint injuries. Allman/Rockwood classification of acromioclavicular injuries. In a type I sprain, a mild force applied to the acromioclavicular and coracoclavicular ligaments does not tear them. [8, 9, 11] The injury simply results in a sprain, which hurts, but the shoulder does not show any gross evidence of an acromioclavicular joint dislocation. Type II sprains are seen when a heavier force is applied to the shoulder, disrupting the acromioclavicular ligaments but leaving the sprained coracoclavicular ligaments intact. [8, 9, 11] When these injuries occur, the lateral clavicle becomes a little more prominent. Athletes participating in contact sports (eg, football, rugby, hockey, martial arts) are at increased risk of acromioclavicular joint injuries, [13, 14, 15] and injuries to the acromioclavicular joint are the most common reason that athletes seek medical attention following an acute shoulder injury (glenohumeral dislocations are the second most common injuries seen) (see Shoulder Dislocation). Patients involved in motor vehicle collisions with direct trauma to the apex of the shoulder are also at risk for such injuries. Rockwood CA Jr, Green DP, Bucholz RW, Heckman JD. Fractures in Adults. 4th ed. Philadelphia, Pa: Lippincott-Raven; 1996. Stucken C, Cohen SB. Management of acromioclavicular joint injuries. Orthop Clin North Am. 2015 Jan. 46 (1):57-66. [Medline]. Fukuda K, Craig EV, An KN, Cofield RH, Chao EY. Biomechanical study of the ligamentous system of the acromioclavicular joint. J Bone Joint Surg Am. 1986 Mar. 68(3):434-40. [Medline]. Goss TP. Double disruptions of the superior shoulder suspensory complex. J Orthop Trauma. 1993. 7(2):99-106. [Medline]. Macdonald PB, Lapointe P. Acromioclavicular and sternoclavicular joint injuries. Orthop Clin North Am. 2008 Oct. 39(4):535-45, viii. [Medline]. Pifer M, Ashfaq K, Maerz T, Jackson A, Baker K, Anderson K. Intra- and interdisciplinary agreement in the rating of acromioclavicular joint dislocations. Phys Sportsmed. 2013 Nov. 41(4):25-32. [Medline]. Allman FL Jr. Fractures and ligamentous injuries of the clavicle and its articulation. J Bone Joint Surg Am. 1967 Jun. 49(4):774-84. [Medline]. Tossy JD, Mead NC, Sigmond HM. Acromioclavicular separations: useful and practical classification for treatment. Clin Orthop Relat Res. 1963. 28:111-9. [Medline]. Injuries to the acromioclavicular joint. Rockwood CA, Green DP, eds. Fractures in Adults. Philadelphia, Pa: JB Lippincott; 1984. 860-91. Melenevsky Y, Yablon CM, Ramappa A, Hochman MG. Clavicle and acromioclavicular joint injuries: a review of imaging, treatment, and complications. Skeletal Radiol. 2011 Jul. 40(7):831-42. [Medline]. Rockwood CA, Wilkins KE, King RE, eds. Fractures in Children. Philadelphia, Pa: Lippincott Williams & Wilkins Publishers; 1984. Vol 3: 631. Laprade RF, Surowiec RK, Sochanska AN, Hentkowski BS, Martin BM, Engebretsen L, et al. Epidemiology, identification, treatment and return to play of musculoskeletal-based ice hockey injuries. Br J Sports Med. 2014 Jan. 48(1):4-10. [Medline]. Lynch TS, Saltzman MD, Ghodasra JH, Bilimoria KY, Bowen MK, Nuber GW. Acromioclavicular joint injuries in the national football league: epidemiology and management. Am J Sports Med. 2013 Dec. 41(12):2904-8. [Medline]. Hibberd EE, Kerr ZY, Roos KG, Djoko A, Dompier TP. Epidemiology of Acromioclavicular Joint Sprains in 25 National Collegiate Athletic Association Sports: 2009-2010 to 2014-2015 Academic Years. Am J Sports Med. 2016 Oct. 44 (10):2667-2674. [Medline]. Bergfeld JA, Andrish JT, Clancy WG. Evaluation of the acromioclavicular joint following first- and second-degree sprains. Am J Sports Med. 1978 Jul-Aug. 6(4):153-9. [Medline]. Cox JS. The fate of the acromioclavicular joint in athletic injuries. Am J Sports Med. 1981 Jan-Feb. 9(1):50-3. [Medline]. Slawski DP, Cahill BR. Atraumatic osteolysis of the distal clavicle. Results of open surgical excision. Am J Sports Med. 1994 Mar-Apr. 22(2):267-71. [Medline]. Williams GR, Nguyen VD, Rockwood CA. Classification and radiographic analysis of acromioclavicular dislocations. Appl Radiol. Feb 1989. 29-34. Tischer T, Salzmann GM, El-Azab H, Vogt S, Imhoff AB. Incidence of associated injuries with acute acromioclavicular joint dislocations types III through V. Am J Sports Med. 2009 Jan. 37(1):136-9. [Medline]. Pauly S, Gerhardt C, Haas NP, Scheibel M. Prevalence of concomitant intraarticular lesions in patients treated operatively for high-grade acromioclavicular joint separations. Knee Surg Sports Traumatol Arthrosc. 2009 May. 17(5):513-7. [Medline]. Hudson VJ. Evaluation, diagnosis, and treatment of shoulder injuries in athletes. Clin Sports Med. 2010 Jan. 29(1):19-32, table of contents. [Medline]. Nemec U, Oberleitner G, Nemec SF, Gruber M, Weber M, Czerny C, et al. MRI versus radiography of acromioclavicular joint dislocation. AJR Am J Roentgenol. 2011 Oct. 197(4):968-73. [Medline]. Heers G, Hedtmann A. Correlation of ultrasonographic findings to Tossy's and Rockwood's classification of acromioclavicular joint injuries. Ultrasound Med Biol. 2005 Jun. 31(6):725-32. [Medline]. Faruch Bilfeld M, Lapègue F, Chiavassa Gandois H, Bayol MA, Bonnevialle N, Sans N. Ultrasound of the coracoclavicular ligaments in the acute phase of an acromioclavicular disjonction: Comparison of radiographic, ultrasound and MRI findings. Eur Radiol. 2016 May 28. [Medline]. Alyas F, Curtis M, Speed C, Saifuddin A, Connell D. MR imaging appearances of acromioclavicular joint dislocation. Radiographics. 2008 Mar-Apr. 28(2):463-79; quiz 619. [Medline]. Wojtys EM, Nelson G. Conservative treatment of Grade III acromioclavicular dislocations. Clin Orthop Relat Res. 1991 Jul. 112-9. [Medline]. Press J, Zuckerman JD, Gallagher M, Cuomo F. Treatment of grade III acromioclavicular separations. Operative versus nonoperative management. Bull Hosp Jt Dis. 1997. 56(2):77-83. [Medline]. Schlegel TF, Burks RT, Marcus RL, Dunn HK. A prospective evaluation of untreated acute grade III acromioclavicular separations. Am J Sports Med. 2001 Nov-Dec. 29(6):699-703. [Medline]. Leidel BA, Braunstein V, Kirchhoff C, Pilotto S, Mutschler W, Biberthaler P. Consistency of long-term outcome of acute Rockwood grade III acromioclavicular joint separations after K-wire transfixation. J Trauma. 2009 Jun. 66(6):1666-71. [Medline]. Leidel BA, Braunstein V, Pilotto S, Mutschler W, Kirchhoff C. Mid-term outcome comparing temporary K-wire fixation versus PDS augmentation of Rockwood grade III acromioclavicular joint separations. BMC Res Notes. 2009 May 9. 2:84. [Medline]. [Full Text]. DeBerardino TM, Pensak MJ, Ferreira J, Mazzocca AD. Arthroscopic stabilization of acromioclavicular joint dislocation using the AC graftrope system. J Shoulder Elbow Surg. 2010 Mar. 19(2 Suppl):47-52. [Medline]. Gstettner C, Tauber M, Hitzl W, Resch H. Rockwood type III acromioclavicular dislocation: surgical versus conservative treatment. J Shoulder Elbow Surg. 2008 Mar-Apr. 17(2):220-5. [Medline]. Choi SW, Lee TJ, Moon KH, Cho KJ, Lee SY. Minimally invasive coracoclavicular stabilization with suture anchors for acute acromioclavicular dislocation. Am J Sports Med. 2008 May. 36(5):961-5. [Medline]. Rolf O, Hann von Weyhern A, Ewers A, Boehm TD, Gohlke F. Acromioclavicular dislocation Rockwood III-V: results of early versus delayed surgical treatment. Arch Orthop Trauma Surg. 2008 Oct. 128(10):1153-7. [Medline]. Kumar S, Penematsa SR, Selvan T. Surgical reconstruction for chronic painful acromioclavicular joint dislocations. Arch Orthop Trauma Surg. 2007 Aug. 127(6):481-4. [Medline]. Ammon JT, Voor MJ, Tillett ED. A biomechanical comparison of Bosworth and poly-L lactic acid bioabsorbable screws for treatment of acromioclavicular separations. Arthroscopy. 2005 Dec. 21(12):1443-6. [Medline]. Kim SH, Lee YH, Shin SH, Lee YH, Baek GH. Outcome of conjoined tendon and coracoacromial ligament transfer for the treatment of chronic type V acromioclavicular joint separation. Injury. 2012 Feb. 43(2):213-8. [Medline]. Smith TO, Chester R, Pearse EO, Hing CB. Operative versus non-operative management following Rockwood grade III acromioclavicular separation: a meta-analysis of the current evidence base. J Orthop Traumatol. 2011 Mar. 12(1):19-27. [Medline]. [Full Text]. Bosworth BM. Acromioclavicular separation: New method of repair. Surg Gynecol Obstet. 1941. 73:866-871. Weaver JK, Dunn HK. Treatment of acromioclavicular injuries, especially complete acromioclavicular separation. J Bone Joint Surg Am. 1972 Sep. 54(6):1187-94. [Medline]. Bezer M, Saygi B, Aydin N, Kucukdurmaz F, Ekinci G, Guven O. Quantification of acromioclavicular reduction parameters after the Weaver-Dunn procedure. Arch Orthop Trauma Surg. 2009 Aug. 129(8):1017-24. [Medline]. Abat F, Sarasquete J, Natera LG, Calvo Á, Pérez-España M, Zurita N, et al. Biomechanical analysis of acromioclavicular joint dislocation repair using coracoclavicular suspension devices in two different configurations. J Orthop Traumatol. 2015 Mar 5. [Medline]. Tauber M. Management of acute acromioclavicular joint dislocations: current concepts. Arch Orthop Trauma Surg. 2013 Jul. 133(7):985-95. [Medline]. Trainer G, Arciero RA, Mazzocca AD. Practical management of grade III acromioclavicular separations. Clin J Sport Med. 2008 Mar. 18(2):162-6. [Medline]. Nissen CW, Chatterjee A. Type III acromioclavicular separation: results of a recent survey on its management. Am J Orthop (Belle Mead NJ). 2007 Feb. 36(2):89-93. [Medline]. Phillips AM, Smart C, Groom AF. Acromioclavicular dislocation. Conservative or surgical therapy. Clin Orthop Relat Res. 1998 Aug. 10-7. [Medline]. Lizaur A, Sanz-Reig J, Gonzalez-Parreño S. Long-term results of the surgical treatment of type III acromioclavicular dislocations: an update of a previous report. J Bone Joint Surg Br. 2011 Aug. 93(8):1088-92. [Medline]. Stine IA, Vangsness CT Jr. Analysis of the capsule and ligament insertions about the acromioclavicular joint: a cadaveric study. Arthroscopy. 2009 Sep. 25(9):968-74. [Medline]. Chang N, Furey A, Kurdin A. Operative Versus Nonoperative Management of Acute High-Grade Acromioclavicular Dislocations: A Systematic Review and Meta-Analysis. J Orthop Trauma. 2018 Jan. 32 (1):1-9. [Medline]. Anteroposterior (AP) radiograph of right shoulder showing step-off of the acromioclavicular (AC) joint. Type III acromioclavicular joint separation. Postoperative coracoclavicular ligament reconstruction. The clavicle is back to its normal position. The anchor in the clavicle keeps the allograft tendon from coming off of the clavicle. Also note the distal clavicle has been excised, because it had traumatic arthritis from the injury. Type V separation, characterized by wide displacement of the clavicle in a superior direction relative to the acromion. The radiographic findings denote disruption of the acromioclavicular AC ligaments and coracoclavicular (CC) ligament, as well as the deltoid attachment to the distal clavicle.